Let me clarify that I am not going to tell you that you have power over the weather. Anyone who would tell you that is a false prophet, so you may want to consider listening to someone else. You are not God, but God has power in the midst of the storm. He also has power over the storm, but I want to make application to God being the power in the midst of the storm – the One who can say “Peace be still” in your life. It is difficult for us to balance the sovereignty of God with the storms that are taking place. We know these things will come. God said they would. We wonder why He allows them to happen, yet He shows His power through these storms (not just in the storm itself but in the calm that He can give during and after the storm). I love the account in Matthew 14 of Jesus walking on the water. I am not going to focus on Peter but on Jesus. The wind and sea was tempestuous and tumultuous, but Jesus came walking on top of it. Jesus has power over your circumstance and can walk on top of it because He is all-powerful. He may not change our circumstance, but He can be our focal point so we can be a testimony of the restoration after the storm, the beauty instead of ashes. I don’t know what these days hold for many, but I know the One who holds the world in His hand. He is holding you too! I believe God is not stopping these storms because we brought them on ourselves by global warming. We are reaping what we have sown. I do pray for everyone affected by these storms. May God be with us all in these last days. “I am not going to focus on Peter but on Jesus. The wind and sea was tempestuous and tumultuous, but Jesus came walking on top of it.” — I love this Pastor. Whether intentional or not, this shows and affirms the Holy Spirit’s inspiration in the message. 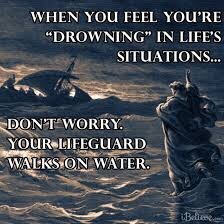 Peter walked on the water also, at least momentarily until he got his eyes on the storm and OFF of Jesus!! When we can keep our eyes on our Redeemer, (Redeemer in all things) then and only then does the storm quiet down and peace start to reign. Doesn’t mean the storm isn’t still raging, it’s just that isn’t what you see any longer!!! Great message, thanks for the reminder, to myself and all of God’s children that He hasn’t lost or given up control!!! God bless richly AND abundantly!! AMEN… The One who holds the future holds my hand! I couldn’t face tomorrow without Him… or today!